The controllers also featured an array of buttons which each game could use as it saw fit for other game options. Games came with little cards which could be inserted into the controller over the buttons to remind players what the controls were. Games for the machine covered the usual genres you’d expect for the time period, including board games such as backgammon, Las Vegas style video poker (the game bundled with the machine, an odd choice really I think), sport games such as golf and hockey and of course the more arcadey games like Space Invaders and Frogger. The games may have been better than their Atari 2600 counterparts, but the only one that sticks in my mind was a car driving game whose name I don’t know that you sometimes saw Michael Knight playing inside KITT on Knight Rider. The Intellivision ended up being quite popular in the US, giving Atari a good run for their money, but certainly in the UK it struggled to make the same impression that the 2600 did. Part of the reason for its popularity was the proposed keyboard controller add on which would turn the console into a fully functional computer with keyboard and tape deck. 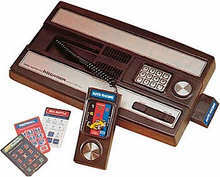 Sadly, it never got a proper release due to reliability issues, and most of the few that did make it into Intellivision owners were recalled by Mattel. Another notable add on for the machine was the Intellivoice, which brought synthesized speech to certain games, something which was unique at the time. In the end though only four games were produced which took advantage of it, so this add on ended up being fairly unpopular too. This entry is filed under Toys - Videogames	and was posted on January 22nd, 2010. You can follow any responses to this entry through the RSS 2.0 feed. You can leave a response, or trackback from your own site. 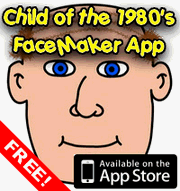 Didn’t Mattel make a comouter later ? A quick bit of eBay research reveals they did and it was called the Aquarius. I liked the Cartridge slot on it. Have you done the Vectrix yet ? I had forgotten all about the Aquarius. That was the weird white and pale blue one, looked a bit like a Fisher Price toy (which makes sense if it was by Mattel). I haven’t done the Vectrex yet, but it’s sat on my list waiting its turn! I had too till you put this article up ! Don’t forget Orics and Dragons.